In this article, the Vice President of the Foreign Educational Service answers many of your questions about God's Work outside the United States, and discusses the new doors God is opening up to the "Foreign Work." THE sun never sets on the Work of God! No matter where you travel in this wide world, you are never far from a Church of God or an office of Ambassador College. Though by the world's standards this Work is still small, no longer can it be compared to a grain of mustard seed. 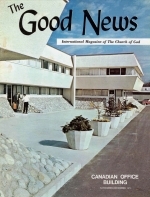 In the month of July, 1971 The PLAIN TRUTH was printed and mailed to over two million subscribers. It went out in five languages to nearly every nation on this planet!